Finally, Blogger is back in her usual space and ready to go with fresh posts. A quick reminder, Blogger Candidate Forum will appear on Wednesdays through the November General elections. Check the blog posts for updates. Today we revisit the subject of Pershing Square in Downtown Los Angeles. 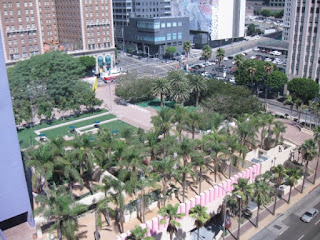 To refresh your memories, in a post titled "Bold Visions For Pershing Square" (Jan 12, 2016), we talked about the design competition, sponsored by Pershing Square Renew (http://www.pershingsquarerenew.com), to remake this rather sad looking space into a bold and exciting public square. The competition was whittled down to four finalists: SWA and Morphosis; James Comer Field Operations with Frederick Fisher; Agence TER with SALT Landscape; wHY with Civitas. Today we are going to take a look at not only Pershing Square but also Grand Park-a park that Los Angeles Times architecture critic Christopher Hawthorne, in his article " Two downtown L.A. parks and the tricky task of designing them to best serve the city," serves as a cautionary tale for how best to serve the needs of its users in the bustling downtown area. In the spring of 1985, the late Times columnist, Jack Smith, wrote an article for said newspaper with the headline "Can Downtown L.A. Survive Its Own Heady Prosperity?" 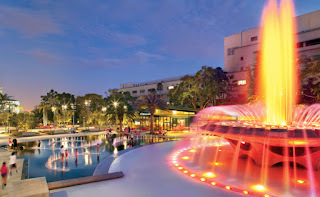 Mr. Smith used the space to muse about what should be done with Pershing Square, the city's most significant public space that had undergone its most recent makeover just prior to the 1984 Summer Olympic Games. 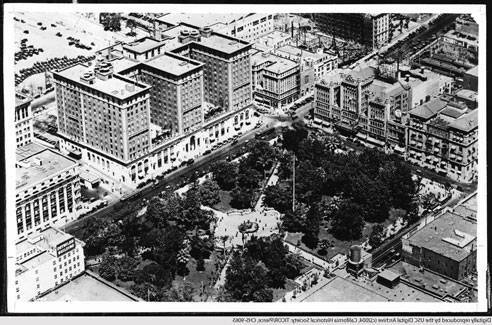 As he and then-newly appointed executive director of the Pershing Square Management Association, Janet Marie Smith, walked through the park "They agreed that the success of the square was crucial to the future of downtown Los Angeles,..." Downtown Los Angeles was in the middle of a building boom and the pair wondered how to make the ramps leading to the 1951-built underground parking garage work and how to deal with the needs of the homeless men who gathered in the square with the public. Mr. Smith passed away in 1996 and Ms. Smith (no relation) is now an executive with the L.A. Dodgers baseball team. New skyscrapers are going up around the park and the Pershing Square Renew initiated a bold competition to reimagine it. 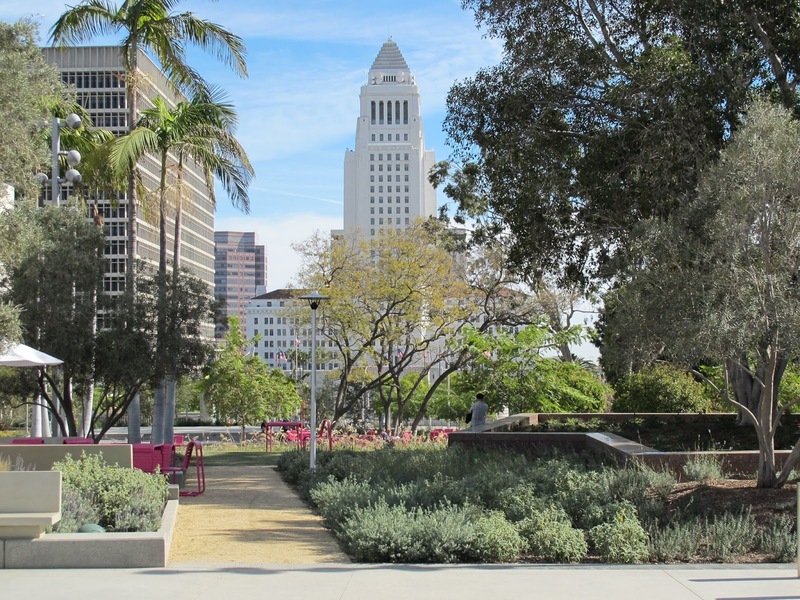 What is different between then and now is the city and county are lavishing attention on public spaces, throughout L.A., and even designing new spaces. 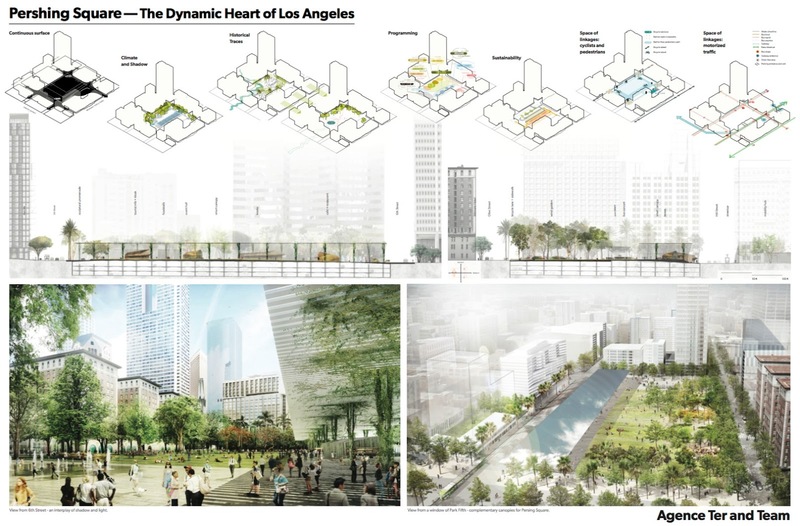 While the Pershing Square competition moves forward, a second competition is underway. 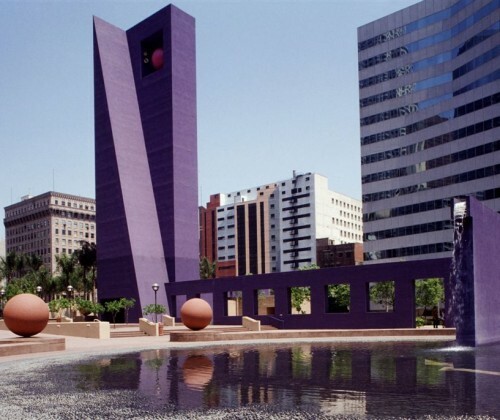 This contest, sponsored by the city's Bureau of Engineering and the Department of Recreation and Parks, is focused on creating a new public square adjacent to Grand Park and across the street from City Hall, located on 1st and Broadway. The site covers 2 acres, where state offices buildings once resided. 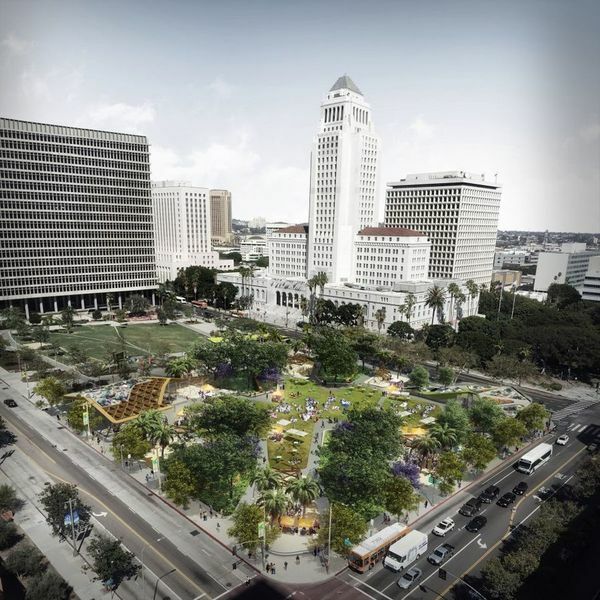 Mr. Hawthorne writes, "Like the Pershing Square competition, this one has been narrowed to four finalists who included prominent names in architecture and landscape architecture." Pershing Square is no longer the central space in downtown. Quoting Jack Smith, Christopher Hawthorne writes, as just about its only remaining open space, unless you count parking lots. In its own way, Southern California is starting to make up for ignoring the public realm in the postwar period. Should we not heed Pershing Square as a cautionary tale? Au contraire. Mr. Hawthorne writes, "We should. And if we're being honest we should acknowledge that to a certain degree it will probably always be one-especially when it comes to the complexity of retrofitting the car-dominated landscapes of 20th century Los Angeles for a new era." Case in point, the 1986 competition overseen by Janet Marie Smith's organization. The competition feature a starry panel of juror that included architect Charles Moore, landscape architect Garret Eckbo, and sculptor Robert Graham. The finalists included unknowns-New York architect Kevin Bone, whose entry tried to imitate the swooping arcs of the Southern California freeway-as well as well-known architect James Wines of SITES Projects, who recommended converted Pershing Square into "an undulating grid of plants and hardscape." Mr. Wines won the competition, but his design was never built. It was not all loved by the public and raising money proved to be a difficult task. According to Mr. Hawthorne, "His proposal-for what he called, in the flush of victory, a 'magic carpet' for L.A.-flew off and was never seen again,..."
Instead of a "magic carpet," Mexican architect Ricardo Legorreta and landscape architect Laurie Olin presented a less fanciful design. 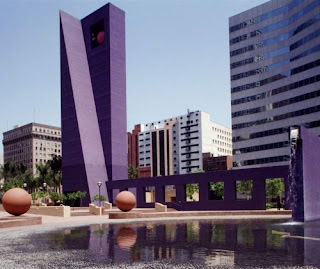 Their park was completed in 1994 and essentially hated by all for "...redoubling the square's sense of isolation and replacing grass and tress with imposing walls and towers in purple, orange and bright yellow." In fact, dislike for this particular design is so strong that local design history repeated itself. 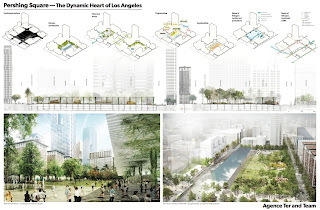 Mr. Hawthorne writes, ""Pershing Square Renew, with backing from Councilman Jose Huizar and real-estate interests including the firm MacFarlane Partners,..., launched a design competition last year." The ten member jury (including Council member Huizar, developer Wayne Ratkovich, and chair by Ms. Smith) has winnowed the list of ten semifinalist down to four finalists. The teams were given strict instructions to produce conceptual, not finished proposals, although one finalist the Paris landscape firm Agence Ter muscled its way into the final by ignoring that rule and producing a "appealingly straightforward, nearly complete design call for a tall, shade-giving canopy along the southern edge of the park." The remaining finalists are an all-starchitect line up of designers: James Corner, the co-designer of the Highline in New York City and Frederick Fisher; landscape firm SWA Group and Morphosis; Kulapat Yantrasast of the local firm wHY and the landscape firm Civitas. The contest is anticipating a large budget for the park, well over the $11 million designated back in 1986. Once a winner is chosen, serious fundraising will begin. Christopher Hawthorne hopes that a significant amount will be set aside for maintenance and programming. The finalists are an extremely talented group and will present their design to the jury on April 27 and a public event scheduled the next day. It is entirely possible that the winning design will come find a dynamic way to stitch the park back into the downtown fabric. What should give us a reason to take a breath is the eternally attractive approach to fixing the park is tabla rasa-clean slate. Los Angeles tried it in 1910, when architect John Parkinson dressed the square (then known as Central Park) in the fashionable Beaux Arts. It happened again in 1951, installing the underground parking garages. One more time, when the magic carpet flew off into the wild blue yonder, giving way to current Legorreta configuration. Honestly, the Legorreta design is not perfect. Christopher Hawthorne calls it "...insistently introverted to the bold, sharply geometric achievements of Mexican modernism. It has not been well maintained." There is something positive to be said of the Legorreta conception: "It is also a clear expression of a certain moment in the cultural life of L.A., a moment when the city acknowledged it was quickly becoming a Latino metropolis." Now, the Ricardo Legorreta conception is dated but "...a new appreciation for it should begin seriously building in a few years." 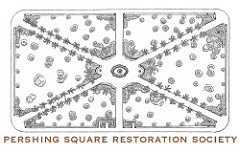 A group calling itself the Pershing Square Restoration Society (restorepershingsquare.blogspot.com) is opposed to the current competition and is calling for the restoration of the 1910 Parkinson design. The park was lovely however, Mr. Hawthorne observes, "it would be impossible to re-create it without offering at least a tacit endorsement of the cultural politics that gave rise to it, which were animated to a large degree by a desire to whitewash the complicated racial history of early L.A...." More succinctly, trying to re-create the architecture of an early time almost always turns out Disney-esque. How about restoring and rehabilitating the strongest elements of the Legorreta configuration, while opening it up, making it more inviting, and removing some the larges flaws? Could be a fascinating exercise and, as Mr. Hawthorne writes, "...a concession that L.A. is overdue in coming fully to terms with its messy, flawed urban history, which is far more deeply layered than we typically let on. In the meantime, less than a mile away, 1st and Broadway (FAB), is taking a more cautious but certain path toward completion. For one, the budget is smaller-$10 to $12 million for construction-the money is already available in the form of Quimby fees dunned from residential developers. The design competition for this project was limited to a pre-approved list of architects and landscape architects. Therefore, this is not so much an extension of the county-built Grand Park as a competition to it, "...an assertion by the city that it too can produce prominent downtown park space." In one respect, FAB has potential to out shine Pershing Square. The site has no parking ramps. The site, purchased from the state in 2013, is totally cleared, almost flat, and sites at the footsteps of City Hall. The finalists for the FAB-ulous competition Eric Owen Moss; landscape architect Mia Lehrer with the Office for Metropolitan Architecture; the multi-national design firm AECOM; and the architecture firm Brooks + Scarpa with Bay Area landscape architect Walter Hood. Christopher Hawthorne observes, "The designs themselves are all over the map, reflecting a competition brief from the city that asked each team to include ideas for a 'full-service destination' restaurant for 200 diners, plenty of open space and room for rotating art and architecture exhibits." When the winner is finally announced, according to L.A.'s chief deputy engineer Deborah Weintraub, "...it will be selecting not a proposal but a team to work with in fleshing out the final design. This is a good thing because, according to Mr. Hawthorne, "...each of the four designs is too busy, tries too hard and packs too many elements into the park's acres. At the same time, each is surprisingly timid about architecture, the proposals hide the restaurant building under a parade of green roofs and bermed forms." 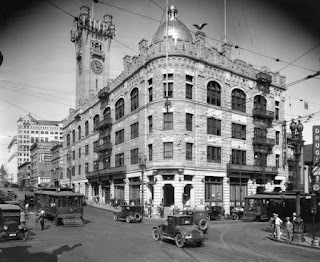 Eric Owen Moss's design is fully fleshed out and "the most powerfully strange, with a humpbacked white observation tower along 1st Street. It also shows perhaps the least room for improvement, having nearly reached the limits of its compellingly odd logic already." Mr. Hawthorne prefers the Leher-OMA or the Brooks + Scarpa and Hood entries-then start from scratch with the goal of a more calm, considered design that works well with Grand Park. 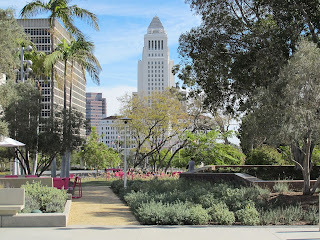 While the tabla rasa approach may not be the best choice for Pershing Square, it just be the right way to approach the park at the feet of City Hall.